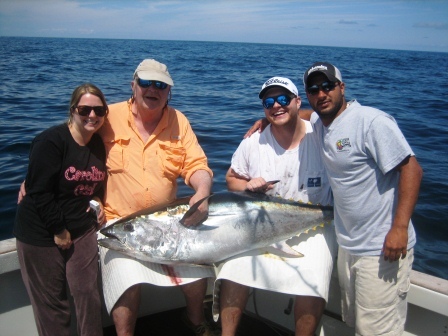 The Evans family’s recent bluefin tuna charter on Tuna Hunter yielded just the right size bluefin tuna for the grill, and some sushi along the way. All family members took a turn on the reel, battling the bluefin to the boat where it was measured at 58 inches, just under the keeper limit. Current (as of this trip) bluefin tuna regulations allows for one fish 27-47, one 47-59, and tuna 59 to 73 must be released. Tuna Hunter practices tag and release, using tags from the Large Pelagic Research Center, to support bluefin tuna research. We were ready to tag, but this tuna was a keeper.